The Corning OptitapTM test jumper enables you to directly connect to optical power meters for quick in-field testing. 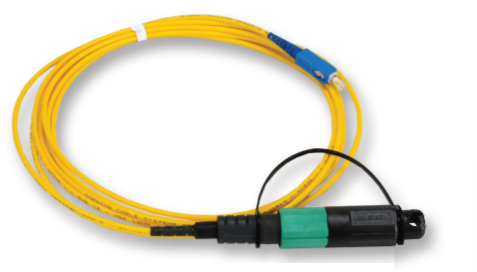 Optitap Test Jumpers permit rapid connection to external flush-mounted bulkhead adapters on terminals or closures to allow testing of OptiSheath® MultiPort Terminals and OptiSheath® UCAO Terminals. 1F singlemode (OS2) jumper lead 2.9mm diameter, 3m in length. Terminated both ends with factory-terminated, environmentally sealed and hardened SC/APC and SC connectors. Sheathed in LSZH. Please enter your email address below to receive the OptitapTM Test Jumper Leads datasheet in your inbox. Corning OptitapTM Test Jumpers are available from stock for collection or delivery. All orders placed before 5pm can be delivered next day subject to confirmation at time of order. Please contact us for more information.